As the stalemate between the President and Congress drags on, parts of Southwest Florida are already feeling the direct effects. 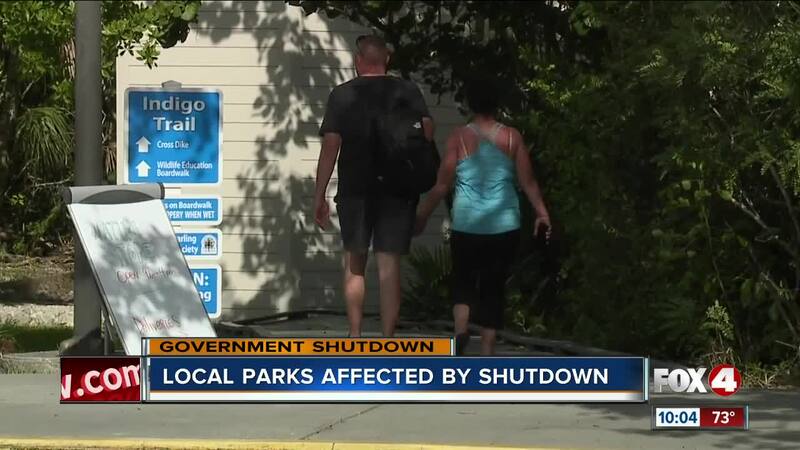 Visitors to Sanibel's Ding Darling National Wildlife Refuge , are not going to be able to get the full experience. Birgit Miller, Executive Director at Ding Darling Wildlife Society, says, "People from all over the world come to visit this refuge. Of course they’re disappointed that the visitor and education center, free to the general public, is now closed." Visitors can still enjoy the public walking trails, water areas and Wildlife Drive. Miller says, "I’d say during the shutdown, this is one of the busiest weeks of the year due to the holiday." In the visitor and education center is a nature store, which Miller says would probably be generating thousands of dollars in a day in sales. She says, "100% of the proceeds benefit the refuge and conservation efforts, so that’s a loss." Visitors are not the only ones impacted. So are the people that run the refuge center. Only two people remain working. Miller says, "I believe it’s nine employees that were furloughed, so they cannot come to work. They’re not getting paid. And, you know, they work hard. And it’s a shame that they are staying away from the place they love to come to every day and inspire millions of people to visit this refuge." The immediate future remains unknown for workers and visitors alike. Miller says, "The refuge puts on lots of free programs, come January. And, if the government remains closed, again those programs will not be held as a result of a government closure."